Are you ready to transform your table into a DIY farmhouse table for real cheap!? 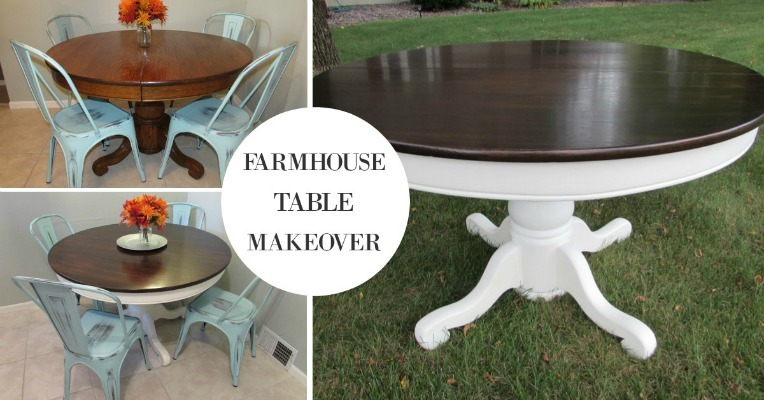 I was, and I’m SOOO excited to share with you how our Farmhouse kitchen table turned out! I think you’ll love it just as much as I do. I decided to step by step lay out exactly how I did it, so you can replicate it. You won’t regret it if you do! I mentioned before we had to sell our original rustic farmhouse dining table that we hand-built when we moved into our first home… So back to the drawing board, we went. Until we went shopping for a new table. We live on a budget, there was no way I was going to spend $1000 on a table. So we started searching for thrift stores and Facebook marketplace. Shortly after my husband came across this farmhouse table for sale on Craigslist. My husband was convinced that with some paint and a little work it would turn into something we’d love.. so we brought it home. 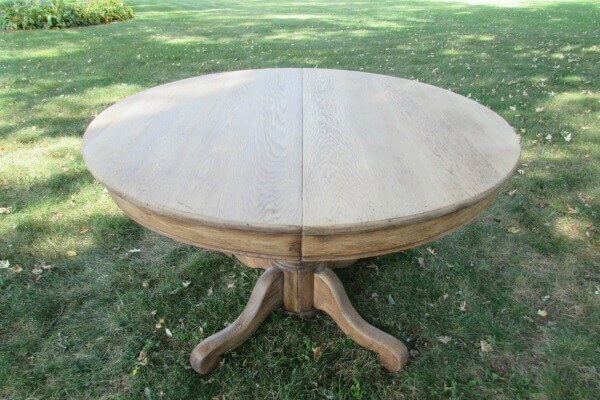 This solid oak table was dated and the base of the table was split down the middle. The table was supposed to slide apart to expand, however, only the top moved apart and the bottom was stuck together. We were actually told a gentleman handmade this table years ago. With a little determination, I knew this table would turn out how I envisioned it in my head. We couldn’t beat the $100 price tag so we took it home! 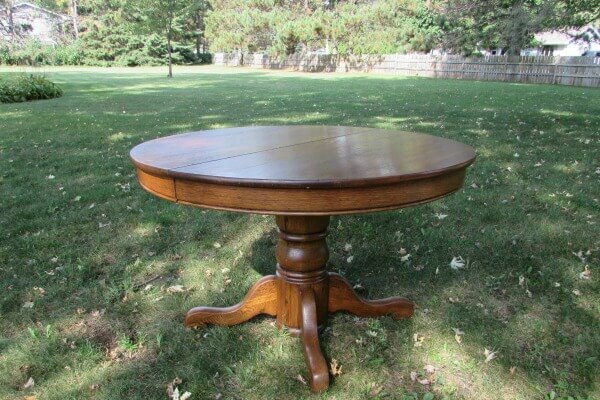 Here are the steps to refurbishing an old oak table similar to the one above. You can use the same steps for just about any wood table. This DIY farmhouse table makeover will have your table looking like an expensive pottery barn farmhouse table, only for a fraction of the price. We have kids and we used our table for a few months before we had time to conquer this project, so a good cleaning was a must. Then it’s time to move your table outside or into your garage. Tip: Be prepared to be without a table during your dining table makeover. You can start by sanding the top or the base of the table, whichever you prefer. We started by sanding the base of the table. Flip the table upside down so you don’t have to hunch under the table. We may or may not have crawled under the table for a good 10-15 minutes before it dawned on us to flip it upside down so we don’t kill our backs, lol. We started with a piece of 80 grit sandpaper and began hand sanding the base of the table. It’s surprising how fast most of the varnish came off. Next, use the 150 grit followed by the 220 and then 400 grit sandpaper for a nice smooth finish. You can use any combination of sandpaper, that is just our preferred method and it works quite well. The lower the grit the more course and grittier the sandpaper will be. We tried starting out with the 150 but switched to the 80 because it wasn’t taking off all the varnish. Once you’ve finished sanding use a cloth to wipe off all the excess dust. Any old piece of cloth will work. Then use a tack cloth to wipe down the base thoroughly. If you haven’t used a Tack cloth before, it might just become your new best friend. These cloths are awesome, minus the texture of the cloth itself, you’ll know what I mean once you use one. These little tack cloths are great for picking up any dust on your project before you start staining. I use them all the time and they are pretty cheap on Amazon. Now it’s time to flip over the table and sand the top. This is where the electric sander comes into play. Use the same method with the sandpaper and the electric sander, 80, 150, 220 and 400 grit. I think it took around two hours to get all the varnish off both the top and the base of the table. Now on to the fun stuff!! Let’s see this table transform. You can use any color of stain on the top of the table. We used Varathane KONA Wood Stain. I personally love this color stain. We have used this color on multiple projects so it’s always our go-to stain. Don’t forget, I highly recommend wearing gloves. Either pick up some cheap plastic gloves or if all else fails use your kitchen gloves for washing dishes. You’ll be thankful you did when you’re done! We taped off the table before staining the top so we wouldn’t get the stain on the rest of the table. Dip your rag into the stain and start spreading it over the table. Make sure to use a cloth that doesn’t have fuzz all over it, such as cotton. (We made the mistake of using a cut up shirt in the beginning). Cover the table with stain using long strokes that follow the grain pattern. Let the stain sit for 5 minutes, then use another cloth to wipe all the excess stain off. Repeat by adding more stain until you achieve your desired color! Keep the weather in mind if you are staining outside. The temperature plays a role in how fast stain will or won’t dry. Stain doesn’t dry well if it’s hot and humid out or if it’s too cold. Once you get your desired shade then you are done with the top. I knew I wanted a white base for our table so I decided to experiment with chalk paint. I went to Home Depot and bought the color Everlasting by Americana Décor. I ended up putting 3 coats on the base of the table before I got the desired look I was going for. What I love about chalk paint is by the time I had the first coat on I could start with the second. Chalk paint only takes 15 minutes to dry. When I was done painting, I did one coat of Crème Wax just to seal the table. It goes on so easy and it dries almost immediately. Chalk paint tip: One benefit of using chalk paint is that you don’t have to sand before painting. I sanded our whole table before deciding to use chalk paint. Finally, its time to poly the table. We like to use Varathane brand Polyurethane with a semi-gloss finish. This is our go-to poly because of the smooth finish it leaves and how easy it is to apply with a foam brush. We did 3 coats to make sure it had extra protection since it’s a kitchen table. If there are any rough spots in between applying the coats you can lightly sand it using 400 grit sandpaper. Make sure to follow the wait times on the can in between applying the coats and enjoy your new farmhouse table! This project came about because we didn’t want to spend a ton of money on a new farmhouse table. 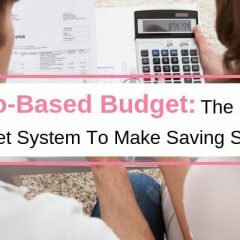 We are all about saving money and we love a good project! 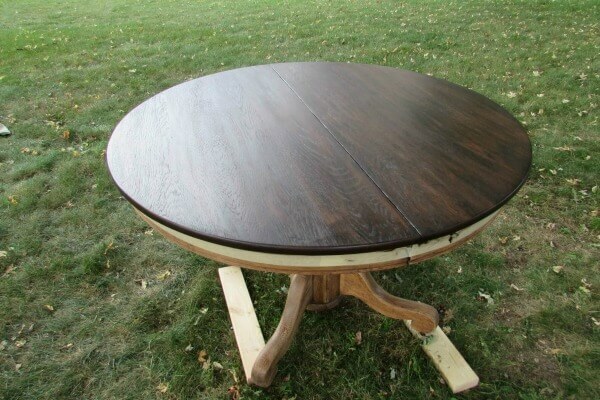 If you transform your old table into a DIY Farmhouse table let us know how it goes in the comments below! Ibotta: This is by far my favorite app to get cash back when I shop in stores or online. Whether I’m buying groceries or going to Target for everyday essentials, Ibotta has great deals that you need to take advantage of! The other day I got $1.20 cash back from a $3.60 box of granola bars. When you signup with our link you’ll get a $10 welcome bonus. Credit Sesame: Have you checked your credit score lately? I recommend checking your credit score at least once per year. My choice for getting a quick and FREE credit score check is Credit Sesame. 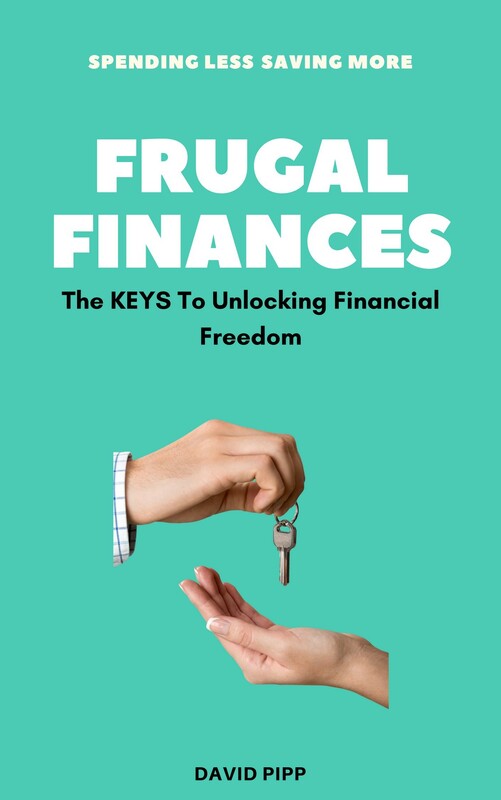 They require a minimal amount of information to get your credit score and they have a bunch of other useful finance tools at your disposal. Affiliate Marketing Help: If you run a blog and need help with your affiliate marketing game, you have to check out Making Sense of Affiliate Marketing. This extensive course shows you everything you need to monetize your blog. 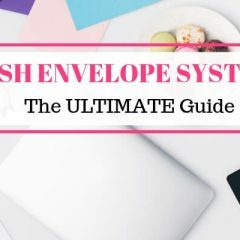 Making Sense of Affiliate Marketing has seriously changed the way we look at blogging and has helped us grow our blogging income substantially. 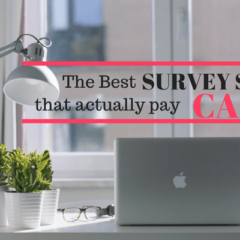 Ebates: If you do any shopping online you need to check out Ebates. Much like Ibotta, Ebates will give you cash back when you shop online at your favorite stores. They partner with over 150 stores so you’ll be sure to find a store you love. Cashback amounts you can receive range from 1% up to 15% or more. When you sign up using our link you’ll get a $10 welcome bonus on your first purchase of $25 or more. 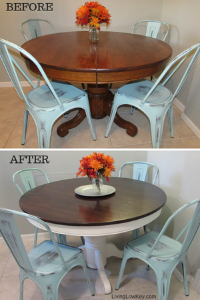 This is a great makeover! I recently redid a dresser using chalk paint and gel stain (too lazy to sand) and think it turned out pretty well! Thanks for visiting and I’m glad you liked how the table turned out. I took a look at your dresser and it turned out beautiful. Nice work! What did you do with the chairs? Did you go with dark stain or chalk paint. I’m curious as I want to do something similar. I love how the table turned out. Thanks for visiting, I’m glad you liked how the table turned out. We bought some chairs online to go with the table. I can try to find a link to them if you’re interested, just shoot us an email? I have this exact table. I’m wanting to do something similar to mine. I don’t have the leaf and I’m stuck staring at the crack in the middle of my table. Do you have any suggestions on what I could do to fill in the crack and make it a crackless table? If your table is like ours, I think it would be pretty tough to make the table top a solid top without replacing the actual top piece. I’m afraid if you tried to glue the two halves together and then fill it with wood filler to smooth it out, it would end up looking funny and eventually crack. You could try cutting something similar to what the leaf would look like and gluing it in the middle. You would have to plane each side and have it fit really flush. Then you would have to sand the top to smooth it all out. Unfortunately, I think it might be a ton of work. If you do go for it, please share a picture. I’m excited to see how your table turns out either way! Hi Cassie, I LOVE your proyect and I would like to know if the Poly you used is water or oil base, I’m painting my dinning table too but I’m not sure yet what kind of Poly to use. Thanks for visiting and I’m glad you liked how the table turned out. We used Varathane Semi-Gloss Poly on the top of the table and I believe it’s a water based poly. It’s held up really well up to this point. Our two little kids have been pretty rough on it and the poly is holding up to their abuse! Feel free to share a pic of your table when it’s all done! We’d love to see how it turns out. Did you polyurethane the bottom of the table as well as top? I’ll be using regular semi-gloss paint on bottom. No, we only did the poly on the top. We did three coats to give it a nice layer of protection. Unfortunately our 2 year old still managed to break through it with a fork lol We used a wax cream over the chalk paint on the bottom. I have the exact table & want to do the same, when you put on the wax, how did you apply it & how many coats did you use? 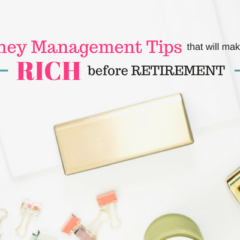 Thanks for checking out our post! I’m glad you liked how the table turned out. When we did the wax, we did 2 coats on it and it seems to be holding up pretty well. We applied the wax with a paint brush. It went on pretty easy. I’d love to see how your table turns out when it’s done! I also have four matching chairs but am really kind of at a loss about how to do them?? Ugh. Did you use the poly on the bottom part with the chaulk paint or just the top? I’m assuming just the top since you mentioned using the wax after the chaulk paint! If you’re undecided on stain colors still, try getting a piece of oak (assuming your table is made of oak like ours was) and test some stain colors on it. That’s a cheap way to decide on a stain color. We only used Poly on the top of the table. We used a wax coating on the bottom and applied 2 layers. It’s held up pretty well. Hey there I love this idea. I have oval long style table and 4 chairs. I was wondering if I painted the chairs with the chalk paint as well would I put the poly over the chairs after it’s dried? We made a bench seat for another table we did and we put a coat of poly over the top to protect the seating surface. It turned out pretty good and protected it from spills and scratches. You could put a coat of poly over the chair tops and it should be fine. Vandalism! You took a potentially beautiful example of classic hardwood furniture and turned it into a yuppy-inspired eyesore that looks most appropriate for a daycare. Some years ago, I rescued a very similar, possibly identical piece from a bunch of poker-playing overage frat-boys, stripped off layers of carpet underlay and green felt, and restored it to its former dignity as a finely-made piece of 20th century production craftsmanship, using its (thankfully) untouched centre leaf as a guide. You people would paint a polyester leisure suit on an original Rockwell just to make it “fresh and updated”! I doubt that my comment will ever be reprinted. Since all the comments printed so far are universally overflowing with praise, it’s obvious that you have edited out any that are less than fully impressed with your dimestore “improvements”. 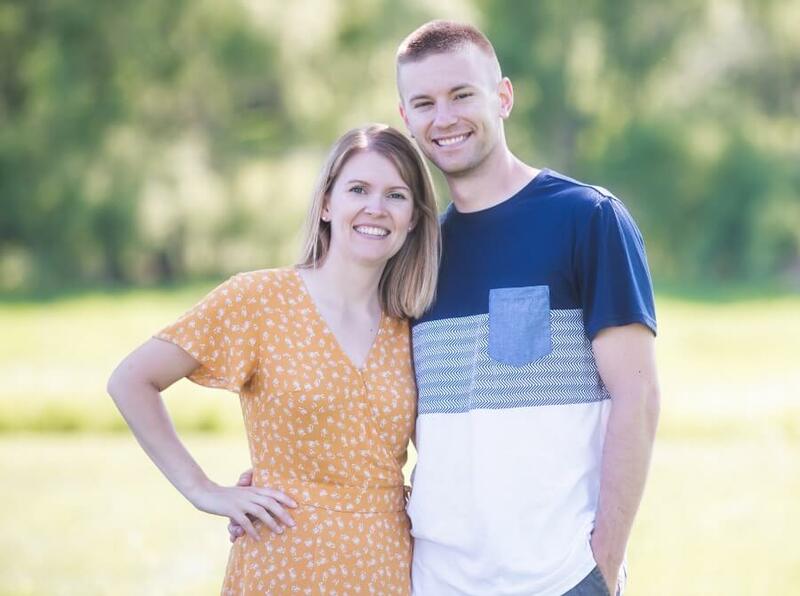 Thank you for stopping by and checking out this post. I’m sorry that you didn’t enjoy our work. Luckily for you, you don’t have to stare at it every day. We are happy with how it turned out as it went well with the decor of our house. I love what you have done to the table. I had one just like it, and gave it to my daughter. I bought new,, looking back I wish I would have kept it, and done this to it. I told her if she ever wants to get rid of it, to please give it back to me. Again, great job and now it’s more beautiful than ever! Thanks for checking out the post! I’m glad you liked how the table turned out. 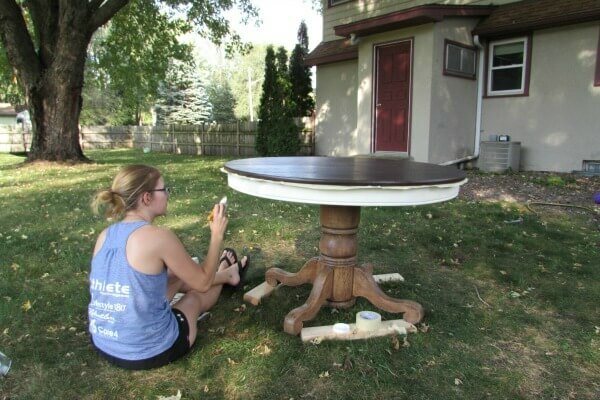 We are happy with how it turned out, if your daughter gives your table back to you or if she is looking for an upgrade on it, this was a fairly easy project and can be completed in a day or two. Let us know if you need any help! Why did you even stop by to say anything? If you didn’t like this project then you should have just moved along. I’m just flabbergasted that someone would be so nasty about something that doesn’t even concern them/you. Found this on Pinterest – what a beautiful job! This came out so well and you make it look so simple that I’m tempted to do the same with our identical hand-me-down table that is in super rough shape. Can you estimate how long this took you, from start to finish? It looks like you did it all in a day, but just curious! Thanks for checking out the post and I’m glad you loved how the table turned out. If you’re thinking about doing your own table makeover I think you should go for it!! This took us two days to finish. The only reason it took two days was because we wanted to let the stain on the table top sit for a day before we put the poly over it. It ended up going a lot faster than we thought it would. I’m glad you loved how the table turned out! If you’re thinking about doing your own table makeover I think you should go for it!! This took us two days to finish. The only reason it took two days was because we wanted to let the stain on the table top sit for a day before we put the poly over it. It ended up going a lot faster than we thought it would. This process is not simple. It takes loafs6of due diligence. I am 60, a retired Interior Designer, an artist, and am passionate about furniture restorating and refinishing. 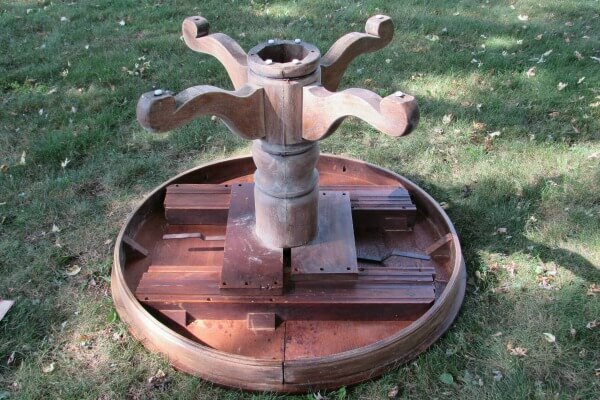 I have never used a sander on a piece of furniture and have restored over 300 pieces. I use stripper to remove all manner of issues. I said lightly between coats of paint, etc. My finished are superb, and have sold pieces for a few grand. The point is that sanding always takes the wood with it. Do your homework. Thank you for showing your table transformation. I have exactly the same table but we removed the top part of the pedastal and converted it to a coffee table., keeping the legs. We removed the varnish and waxed it so it has a much lighter oak colour than your starting photos. From an unused piece of furniture we now use it everyday in our family room. It’s also interesting that the same piece of furniture is something I inherited and we live in New Zealand. Stacey, I LOVE your story! It’s pretty neat that we both have the same piece of furniture when we live on the opposite sides of the world, lol. I would love to see your coffee table, it sounds amazing!! Love your table! 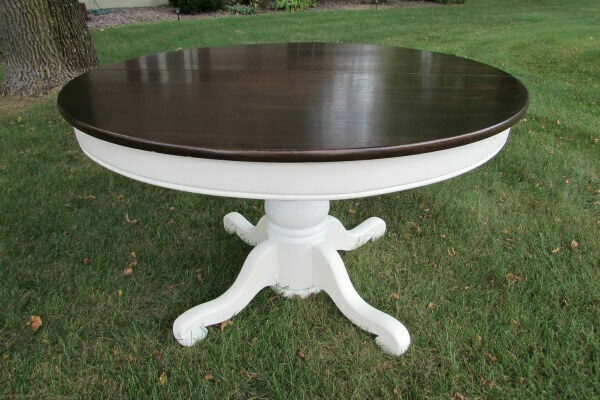 I’m wanting to redo my pedestal table and was wondering do you always have to sand the base if your using the chalk paint? Hi Leah! I’m glad you loved the table. We really love how it turned out!! The stain we used is made by Varathane and is the Kona color. We got it at Home Depot in the paint area. We love how the dark Kona color contrasts with the white base. Hey, love this look! I’m redoing my old table right now. Did you use a foam or paint brush to apply the chalk paint and stain? Hey Heidi! We used rags to stain the top of the table. Rub it on, let it sit a few minutes then wipe off the excess stain. Repeat until you get the desired color you want. =) For the chalk paint, I used just a normal paint brush. There are paintbrushes specifically used for “chalk paint” but they are expensive. A normal paint brush worked just fine. We used a foam brush to apply the poly on the table top once the stain was completely dry. I hope that helps! Thanks, Amby! I’m glad you found us =) Sanding down the old varnish is a must. The paint/stain won’t adhere if don’t break through the varnish. We’ve figured that out through experience, lol. I have a table very much like the one you did the “redo” on. I have NEVER attempted anything like this before, but I have read your post and I think with what you are saying, I can do this project. I have made a list of everything I need and I am going to Home Depot tomorrow to buy everything I need to do this. I would be happy if my project turns out half as nice as your table. I think it is beautiful. I love the paint with the stain idea. I want my table to look just like yours. Wish me luck. I may have questions when I get into this, but I feel good about starting this. Thanks for sharing this idea with us. I’m like a lot of people, I can’t afford to purchase a fancy table like that…..I have to try to make mine. I bought my table with 4 chairs for $25.00. I’m going to paint my chairs white….and I may destress them a little. By the way, I am doing a complete décor “redo” in my apartment. I’m going Farmhouse. So this table will fit right into my plans. Thanks!!! Hey Kathi, I can’t wait to see how your table turns out. Its a lot of work up front but it will be worth it. That’s awesome that you were able to find a table and chairs for that price. I love the Farmhouse look, that’s how our house is decorated as well. If you have any questions while redoing your table feel free to message us! Good luck! This table looks amazing!! Can you tell me how you sanded the rounded edge, was it with the electric sander or by hand? I am working on my own table redo and afraid of sanding the rounded edges. Thank you!! I’m glad you like the table! For the rounded edges we ended up hand sanding them. It took a little longer but we were afraid of over sanding them if we used the electric palm sander. Don’t be afraid to sand the rounded edges, just take your time with it and it will turn out great!! Can’t wait to see the finished product! Did you use the foam brushes to apply the polyurethane? There’s no mention of them or any techniques or many tips for the polyurethane stage. Is it pretty easy/straightforward? That’s a great question! Yes, we used the foam brushes to put the poly on. I made long, slow strokes to avoid any bubbles. On most of our projects where we use poly I do 3-4 coats using a new foam brush each time. Make sure the surface is free of lint or any other debris before you put the poly down so you get a nice smooth finish. Follow the manufacturers recommended wait times between coats and you should be good to go! We actually bought the chairs off Wayfair a while ago. We loved the rustic look they had! Was this a laminate-topped table? I am wanting to redo our table and 2 leaves but it is all laminate on top. Will sanding remove the shiny laminate so stain or paint will stick? Your table is beautiful, by the way! I’m glad you love the table! It was a really fun project. The table is solid wood, no laminate, but it had a really thick coat of varnish on the whole thing to keep it from getting scratched. The hardest part of the whole project was sanding down the varnish so we could get the paint and stain to stick. Feel free to email me pictures of the table you’re going to redo and I’ll see if I can give you some tips. Send it to pipp.livinglowkey@gmail.com if you want! I loved the tutorial – I can’t wait to try it! Does using the was creme wax with the chalk paint make it more durable and less prone to scuffing? We have little boys playing w/ their cars all over the place ! I’m glad you loved the table makeover. We’re so glad we did this and didn’t buy a new $1000 table. We have two little kids who beat up on our table pretty good and it holds up pretty well. We’ve used that combination a couple times and it works out pretty well. Nice job! I love the new look! What a great way to take an older piece of furniture and make it current! Thanks, Melissa! It definitely gave it a whole new look. I love the paint and varnish combo! What an amazing tutorial, what a makeover! The step by step photos are super helpful!